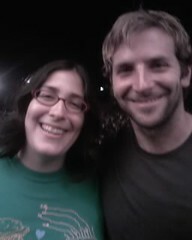 I forgot to say that the first night of the two Hollywood Bowl Radiohead shows I met Bradley Cooper who played my fave character Will Tippin on Alias. He was absolutely rocking out to Radiohead, singing along to every song, closing his eyes, taking photos, etc. Just amazing. He was SO sweet. I am pretty sure he was also high, but so sweet. Wasn't he on Kitchen Confidential, as well? WHAT YOU WERE IN LOS ANGELES?!?! oh sweet, yeah I love taking people for tacos/ice cream/tacos sooo let me know next time if you remember! OMG awesome!!! I sent this post to my friend Ally, bc she loves Alias, too! We're slowly making our way through the series now. I really disliked Will at first, but he's way better now that he's a little dark. I think we're on season 3 right now. I finally saw Alias a couple of months ago (Season 1) & for some reason Will is the character I disliked the most! Anyways, I'm looking forward to seeing the rest of Alias, eventhough the soundtrack is oh so terrible (S.1 at least). I love him in Wet Hot American Summer and the original Stella shorts!